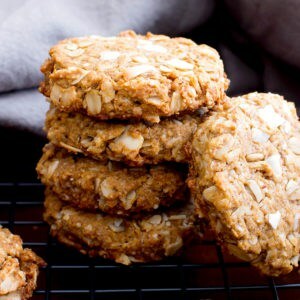 Peanut Butter Coconut Oatmeal Cookies (V, GF): an easy recipe for deliciously thick, chewy peanut butter cookies bursting with coconut and oats. Vegan, Gluten Free, Dairy-Free, Oat Flour, Whole Grain. I heard the first line many times over, during the course of about two years, when my life was hard, when things never seemed to work out… when I truly didn’t believe in myself. The second line I said to others and to myself, many times over, during the course of those two years, convincing myself that I could never be what I wanted to be, do the things I wanted to do… achieve the dreams I was too afraid to even think about. Back then, Erik and I were living in San Diego, dealing with a lot of family issues, tragedy and heartbreaking loss. It was a dark period for my mom, my sisters, Erik and our families. Not one day passed where I didn’t think for a moment that things would never truly get better. Throughout that time, I had baking. And baking had me. I took solace in our tiny, hot—like 110 degrees hot—kitchen, baking until I could bake no more. My mom, who went through so many days full of tears, heartache and despair, would actually light up when I presented her with a baked treat. Made just for her. Erik would laugh for the first time in ages because of some silly thing I did in the kitchen (spilled almond butter all over the counter & myself; made cookies the size of M&M’s just for kicks; drizzled chocolate into the form of Homer J. Simpson to make him smile). My sisters would call the second they saw the surprise on their doorsteps: a care package of 4 different kinds of cookies and candy, made to show them how much they mattered. How much they were loved. And everyday, I would read my favorite food blogs and dream about the day that I might take the chance. But I doubted myself. I doubted my writing, my kitchen skills, my photography, my everything. I had never taken a chance on myself and proven that risk, that faith, that passion (and hard work) can amount to more than other people’s expectations and pressures. I felt this pull to do something more; but I also felt the weight of doubt that had been drilled into me from a very young age. I wanted to pursue this passion, but I was too afraid of how I might fail. Epically. A little over a year ago, I realized that life is just too damn short to hold back. It’s too damn short to live in fear of failure. It’s too damn short to not just try. Since I made the decision to take the leap, everything has changed. Some things more slowly, and other things, very quickly. Every day is full of fear, doubt, and stress. But it’s also full of risk, adventure, and happiness. In less than one year, you shared over 100 photos of Beaming Baker creations on Instagram–made with your own hands, in your own kitchen, and so full of love. In less than one year, you showed me what it really means to connect. To grow, to love, to be a community—all through our shared passion for food and for creating… everything. We took all of our doubts, our worries, our regrets and baked (and no-baked) until they disappeared. We learned how to bake better, create more openly and pursue our passions. Together. Thank you. Thank you for showing me and each other that we can be enough. Inside of the kitchen and out. Everyday, I learn more about myself. I learn that I’m enough—that I’m worth the risk and the effort. The things I care about and the things I’ve always had a passion for—they mean more than pleasing someone else, or meeting someone else’s expectations. I’ve never worked so hard in my life. I’ve never met so many amazing people. I’ve never betted on myself and found myself to be enough. Until now. 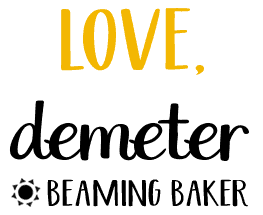 Beaming Baker is now 1 year and 1 month old. There is so much more to see, experience, share and laugh about. I hope that you stay with me, grow with me, and take the risk and make the leap you’ve been too afraid to take. You’re stronger than you know. And you’re totally worth it. 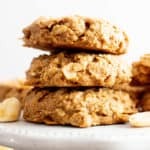 Just about a year ago, I published this recipe for Peanut Butter Coconut Oatmeal Cookies and fretted over what people would think. I had such a blast photographing it, but was very unsure of what direction to go in. Did people want to see the cookies on the sheet? How do I take a photo of a stack of cookies on a plate? Why didn’t I stay awake during that one photography tutorial?? This year, we return to this recipe. A bit more sure of ourselves. 🙂 This time, we’re gonna enjoy a big, warm plate, with an ice cold glass of almond milk (or steaming hot coffee, because: duh). The best thing about these cookies? They’re even better than they look. Will you grab two bowls, a few ingredients and your brightest, most beaming smile… and join me in the kitchen? It’s time to make some edible-awesome magic. Thank you for spending time with me, baking, no-baking, blending, loving, opening up, and sharing All the Things. I can never express to you how grateful I am that you’re here. 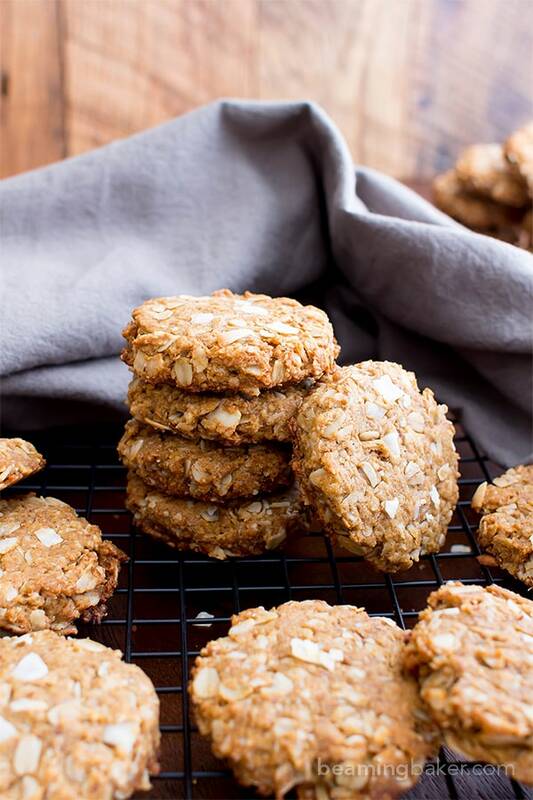 Peanut Butter Coconut Oatmeal Cookies (V, GF): an easy recipe for deliciously thick, chewy peanut butter cookies bursting with coconut and oats. 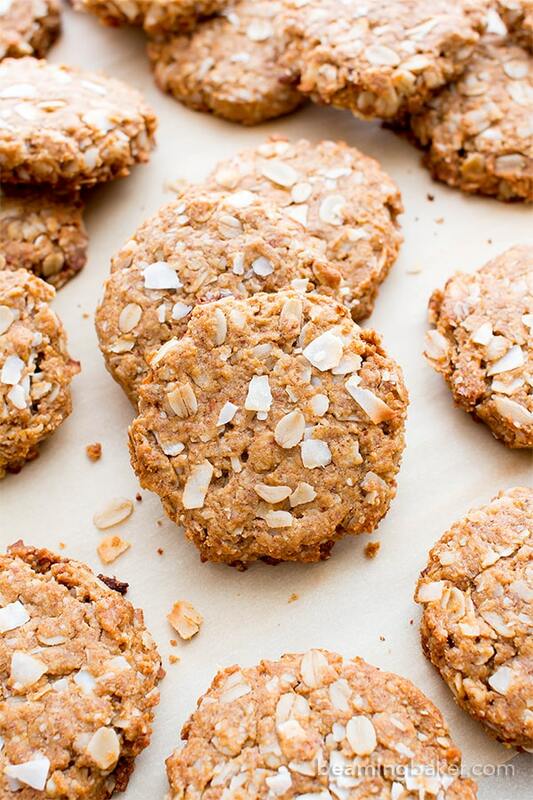 Vegan, Gluten Free, Dairy-Free, Whole Grain, Oat Flour. In a medium bowl, whisk together the dry ingredients: oats, oat flour, almond meal, coconut, baking soda, baking powder, cinnamon and salt. In a large bowl, whisk together all the wet ingredients: peanut butter, coconut oil, sugar, maple syrup, flax eggs and vanilla. Add the dry mixture to the wet mixture. Using a rubber spatula, stir and fold until well incorporated. 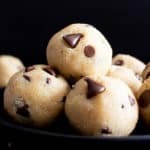 Scoop 2 tablespoon-sized cookie dough balls onto the cookie sheet, spaced evenly apart. 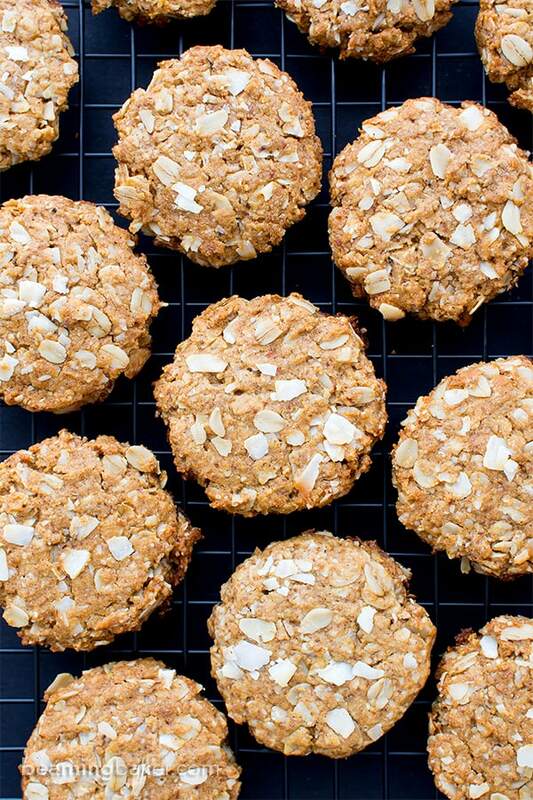 Using a fork, flatten cookies to desired thickness—they won’t spread much during baking. Bake for 10-14 minutes. Using a heatproof spatula, gently lift and transfer cookies to a cooling rack. Allow to cool completely. Enjoy! Storing instructions below. - Store in an airtight container for 1-2 weeks at room temperature. 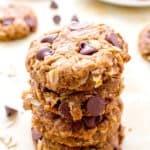 - More cookie recipes: peanut butter chocolate chip oatmeal cookies, dark chocolate almond trail mix cookies, almond butter chocolate chip walnut cookies. 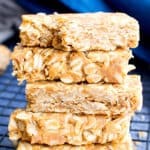 - More Peanut Butter Love recipes: no bake peanut butter coconut bites, peanut butter chocolate chip oatmeal breakfast bars, 2 ingredient peanut butter fudge. Seriously, these were without a doubt the BEST cookies I’ve ever had! You’re welcome! I can’t wait to see what other recipes you have. These look delicious!! 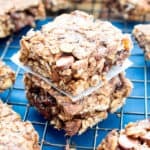 Want to make them for a road trip, would it work to use brown sugar instead of coconut sugar and maple syrup? 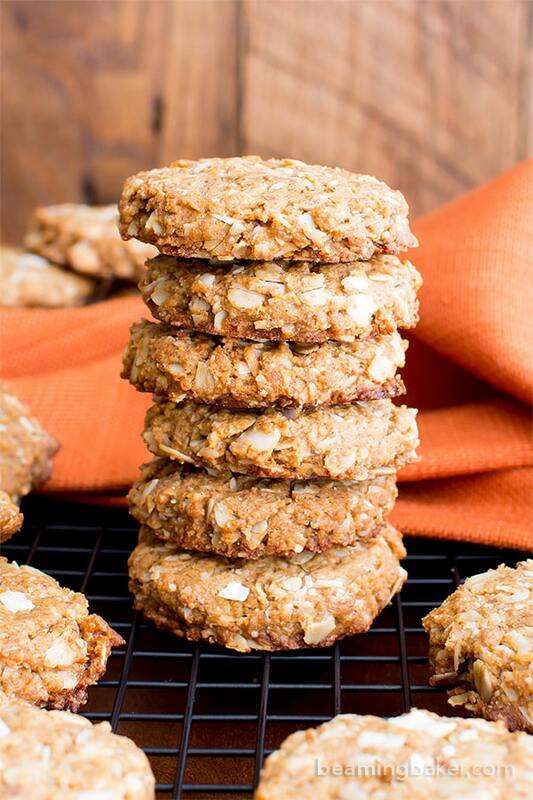 This recipe was my first try at baking cookies and what a joy it was to put together! 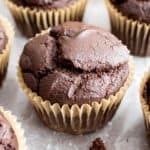 So simple and so super delicious! 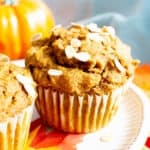 I would never have imagined putting peanut butter and coconut together but it works SO well! I even convinced a few friends of mine who didn’t care for gluten free cookies to try some and they were in LOVE!Thank you! My only problem with the recipe was that it didn’t make as many as I expected even though I followed the recipe exactly. This is SO wonderful to hear, Vagisha! 🙂 Peanut butter and coconut is one of my all-time favorite combos. Let me know if you need any peanut butter coconut recipe recommendations (I have lots to share). 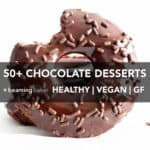 😉 So happy to hear that your non-GF friends enjoyed these so much. 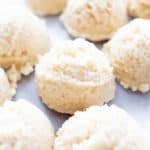 Did you use a 2-tablespoon cookie scoop? I’m taking a long bite into thesse bad babies right no and they taste like I’ve died and gone straight to heaven! Made them going the extra length of grinding oats and almonds. But they are worth it all. FWIW, I generally halve the amount of sweeteners, but found the amounts in this recipe to be right on. Thank you soooo much for the best tasting cookies ever. Oh YEAH!!!! 🙂 I’m so happy that you enjoyed them, Ali! 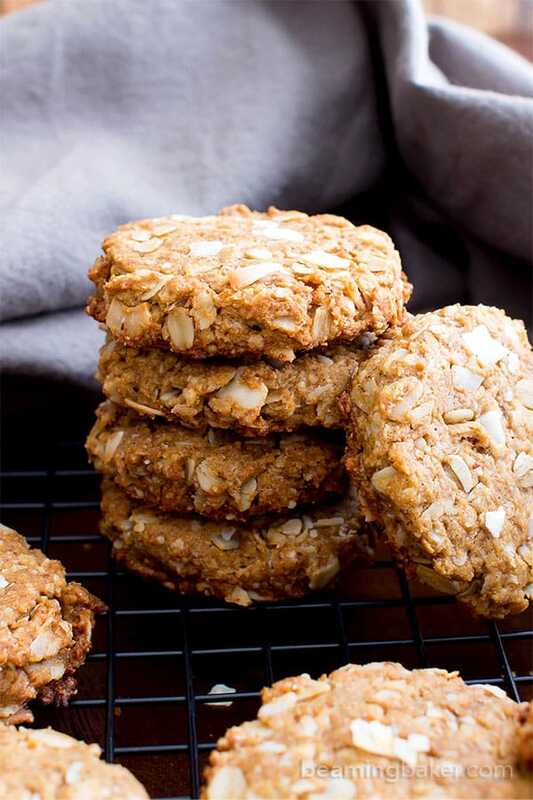 :) Extra props to you for taking the time to grind the oats and almonds. Sweetener: fantastic! I really try to include the smallest amount possible w/o sacrificing taste. Enjoy! And thank YOU for taking the time to let me know. ???? It’s so wonderful to hear that! Oh gosh, I’m always looking for healthy alternatives at events and usually come up empty. I’m sure plenty of folk were so happy you brought these. 🙂 So happy you’re enjoying my recipe. Happy baking! ???? A++++ These are soo good! They have the perfect amount of sweetness, not too much! Thank you for a wonderful cookie made with real foods. I used eggs instead of flax seed eggs and I added chocolate chips to half the batter. 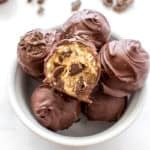 I was delightfully surprised to find that I love them equally – with and without the chocolate chips. I always know I am going to enjoy your recipes and I appreciate that you generously post them. Much gratitude!!! These are AWESOME! I saw this recipe on pinterest and luckily had all of the ingredients on hand and they turned out insanely good! Thank you for sharing! Haha it’s it great when you happen to have everything you need already? ???? So glad you enjoy them!